“Intermission” does the year look-back thing. The American Classic Arcade Museum is seeking donations to aquire several rare classic arcade machines – including Discs of Tron! – from a private collector. I’ve made a donation, and I encourage any readers who are able/willing to do the same. Read on past the jump for details. The American Classic Arcade Museum (ACAM) is located within a famous New Hampshire family entertainment complex called “The Funspot,” which many of you may have seen in the film “King of Kong.” While “Funspot” itself is a business, the ACAM is a registered nonprofit operation dedicated to not only collecting vintage arcade machines but also preserving them to be played by “Funspot” visitors. A private collector has offered to sell them five classic game machines that would be “new” to their collection – Space Dungeon, Mad Planets, Discs of Tron and Black Widow – and ACAM is asking for donations to raise the $1,840.00 needed to purchase the lot on their main website page via the “chip-in” widget. Some of the happiest memories I have are of going to The Funspot during yearly family vacations to the NH area. The “museum” concept is relatively new, a response to the place’s newfound prominence at the start of the Retro-Gaming boom – for the longest time they were simply a place that chose to keep their HUGE collection of game machines in working order rather than junking them for new ones. As a result, they have one of the BEST collections of vintage games – many of them extremely rare (they have a standup “Chiller” cabinet!) – that you can visit and play. They have not asked me to post this information on these blogs – I am doing so to give back to both a good cause and a specific organization that has brought me a lot of good times over the years. I encourage any fans, readers etc. with a few bucks to spare to considering kicking some their way. The amount they’re trying to raise is not very high, and you’ll not only be supporting the good cause of classic game preservation – you’ll be helping these games be placed in a REAL arcade where they can be rediscovered and enjoyed by new generations of gamers who might otherwise never have the chance. Here is the link once again. My sincerest thanks to everyone who chips in, and to Funspot/ACAM for doing what they do. I’m planning to visit the place again this Summer, and it sure would be a kick to take a turn at that Discs of Tron machine when I do. So… yeah, after doing two episodes about “The Simpsons” still being funny, I realized I hadn’t actually watched this year’s Xmas episode, so I did. Fox made it available HERE on their website, though I watched it On Demand. This is the first “future” episode where Homer and Marge actually seem to have personality changes beyond “older” – Marge has a shorter temper and seems a touch jaded, while Homer is sober(!!!) and seemingly more intelligent and good-natured as result. I like that. Running joke about Dearborn, Michigan is edgy as hell by Simpsons standards, to the point where it verged on being out of place. But yeah, I laughed. So, at least according to this timeline, Lisa Simpson is bisexual as a grownup. I like that the “reveal” passes without comment, but it runs one extra beat so you can tell they wanted you to catch it. I know a few BIG fans of Lisa who I can picture turning cartwheels at this… and also a few desperate continuity-obsessives who’ll be furious that this contradicts the character in the “President Lisa” timeline’s claim to being “the first straight female president. Big Picture: "The Simpsons Is Still Funny – Part II"
Escape to the Movies: "War Horse"
“Intermission” is about the Batman Trailer. 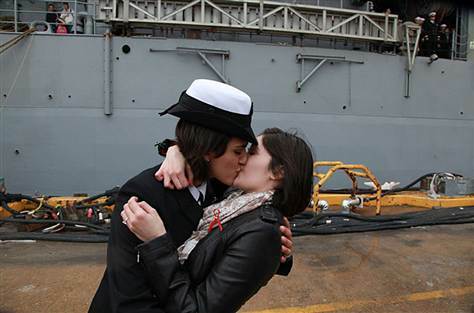 The lucky couple in question are Petty Officer 2nd Class Marissa Gaeta and Petty Officer 3rd Class Citlalic Snell. Gaeta (in the hat) was the returnee, having purchased $50 worth of tickets in her ship’s (The USS Oak Hill) charity raffle where the honor was the prize. Photo is credited to one Brian Clark of The Virginian-Pilot. I hope his contract let’s him retain some rights to it so he can get a cut of the royalties as this almost-certainly winds up in history books, newsreels and museum displays from now until the forseeable future. Ten years ago, the “Lord of The Rings” movies stepped into both a blockbuster-filmmaking realm and a movie-geek culture realm – both of which hurting in the wake of “The Phantom Menace” debacle – and completely rewrote the book. I don’t think that’s exaggerating – I firmly believe that the “21st Century Model” of film-geekdom begins with this series, which took every concievable creative and financial risk and paid them off with a singular filmmaking achievement that in my mind has yet to be equalled. …and now we get to go back. Ye gods… hearing that Howard Shore score kick back up on the soundtrack… seeing The Shire again… it feels like coming home. This is, literally, the LEAST stressed I have felt all December. This, my friends, is THE movie of 2012 as far as I’m concerned. Batman? Small potatoes. Avengers? Slightly-prettier small potatoes. Spider-Man? Don’t even start. Big Picture: "The Simpsons Is Still Funny – Part I"
I didn’t dislike “Clash of The Titans,” but I also don’t remember hardly any of it. In any case, even though no one seems to have really “loved” it it managed to make a MASSIVE international profit theatrically; so Warner Bros. made another one.